It’s time for the Pattern Review wardrobe contest and I’m jumping in again! Last year I had a great time creating my gold and blue wardrobe and I continue to wear those items all the time. I just love this kind of creative push, especially with a deadline to keep me on track. This year’s contest requires a total of 10 pieces; 1 topper that must match all items, at least 2 tops and at least 2 bottoms. This is great because you have 5 free choice items and you can choose what you and your wardrobe need more of…more tops to go with neutral bottoms? Or do you love dresses? It really opens up the possibilities. I decided to start with a concept, just like a designer collection. Don’t you love to play designer in your home sewing studio? Such fun! My theme, my vibe, is “Modern Boho”. This will be my spring/summer wardrobe, and it is a style that will be fun to sew and is easy to wear in the heat of my first summer here in California. Wouldn’t it be amazing to be a Bernina Ambassador? I have always sewn on Berninas, except for a short time in college after I moved away. My mother has a Bernina 830 Record that she bought shortly after I was born. I learned to sew on it. It is a wonderful, reliable machine. When I went away to college, I could only go a few months before I realized that a sewing machine was a necessity. I don’t remember what kind of a machine I bought, but it was about $100 (a lot of money to me!) and I was glad to have something. But actually, it sewed very badly. It skipped stitches, the bobbin thread nested, all kinds of annoying problems. I fell out of love with sewing and didn’t sew for a few years. Then, when I was 23, my mom gave me her Bernina 830. Wait — what? Why? Because she had replaced hers with….another Bernina 830. That’s right, she bought the same machine again, used, but still the exact same model. You see, she is a professional seamstress, and on the occasion of her machine being in the shop she was unable to work, so she needed another one. Then, hahaha, she bought another another one! When she had collected 2 backup machines, she ceremoniously gifted me the original beauty as a very meaningful and loving heirloom. What I’m saying is that I kind of already feel like I’m a Bernina Ambassador, at least for my vintage machine. I love it so fiercely. But, I do want to point out that Bernina and Kollabora are looking for new BERNINA Ambassadors. And with that lucky position comes the chance to sew on a new Bernina for an entire year! I can only imagine with the new models are like. I have not even taken a peek at the amazing features of them because I’m sure I would create a need! The temptation would be very real. 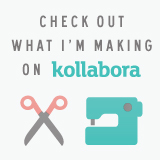 Take a look at Kollabora to get more info on becoming one of the We All Sew content creators. I threw my hat in the ring for this amazing opportunity, but I know there are quite a few talented seamstresses out there who would like creating projects for all skill levels, from DIY fashion to home decor. Head over to Kollabora to read more…and good luck to you! Yes, this post is going up a day late, but I have a really great (sewing related!) reason. In the new house my sewing room is a huge 25 ft by 12 ft space with 4 windows. It is amazing, except one little problem…no lights. No overhead lights at all. This seems to be a common thing here. None of the bedrooms, the living, family room or office have overhead lights. We’ve been buying lamps like crazy to get enough light to do anything at night around here. And since I have a job and 2 daughters, my main sewing time opportunity is after 8pm, but I just wasn’t enjoying it. Well, my amazing husband learned how to install lights last month and has put lights in all 6 of the upper floor rooms and now my sewing room. He had to turn off the power to do it, so I couldn’t post on Saturday. But it was all worth it and you should expect to see my output shoot through the roof! Woohoo! TBC: At this point the fact that I get to share my work on this platform is what motivates me to sew. I am an artist and being able to share my art is awesome! Sometimes I’m a little tickled that so many people get what it is that I’m doing with my sewing. Also this is bonding time for me and my daughter who is my model for my blog. TBC: My favorite thing about sewing is knowing that at the end I will have made something with my hands. I love manipulating fabric into beautiful things…..well they are beautiful most of the times. TBC: Sewing! I know you’re scratching your head right now but let me explain. I know a lot of people LOVE to sew and some even use this as their method of relaxation. I know how to sew and I and really good at it, because I worked hard learning the craft at a young age. I challenge myself by learning new techniques as often as possible but seriously for me sewing can be a chore. I think it is necessary that I go through the making process of putting a garment together to understand what it takes to create but if I could pay someone to sew up my ideals I would. I don’t think I’m the only person out here sewing who feels this way……….am I? TBC: I’m on a sleeve kick right now and I just made two dresses one with a Bishop sleeve and the other with a bell sleeve. I found a lot of sleeves out there that I never attempted so I may continue and make some other sleeves that I found. I am also just starting to explore sewing books, any suggestions on which book to start with? Thank you, Michelle, for giving us an insight into your process and giving us a chance to admire your work!